Albert Einstein once said, "It is my view that the vegetarian manner of living, by its purely physical effect on the human temperament, would most beneficially influence the lot of mankind." Today we can see his prophecy fulfilled. October 1, which has been celebrated since 1977 as the World Vegetarian Day, has a special significance this year. Researchers have recently published their most serious warning yet stating that the inhabitants of this planet will have to become vegetarians within the next 40 years if they wish to avoid disastrous food and water storages caused by the exploitation of water and soil for the production of meat and other food of animal origin. Besides being sustainable, a vegetarian diet, based on foods of plant-based origin, is healthy and delicious. 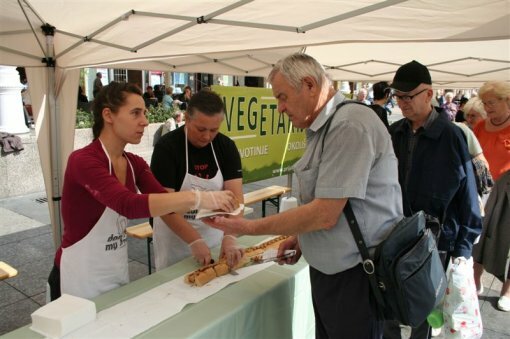 According to recent public polls, as many as 86% of the Croatian population support vegetarianism, and almost 30% stated that they could become vegetarians themselves. 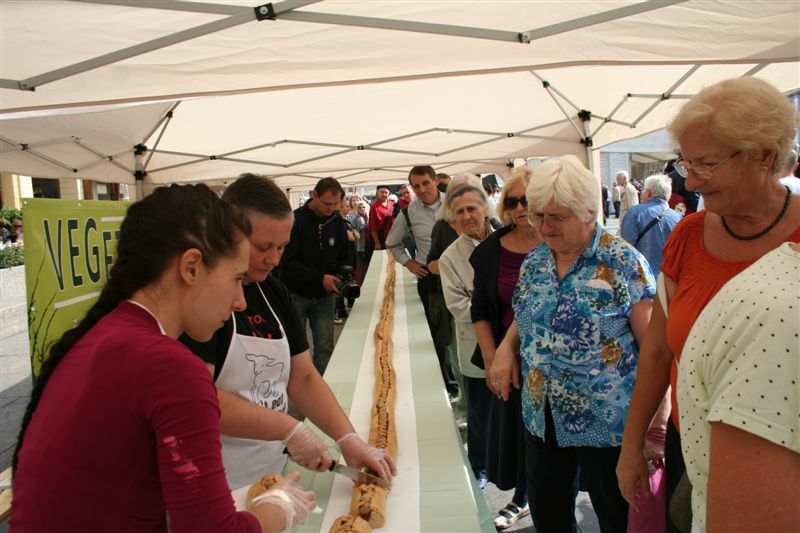 Meatless nutrition has been embraced by more than 150,000 Croats, and the popularity of vegetarianism in Croatia and around the world grows every day. 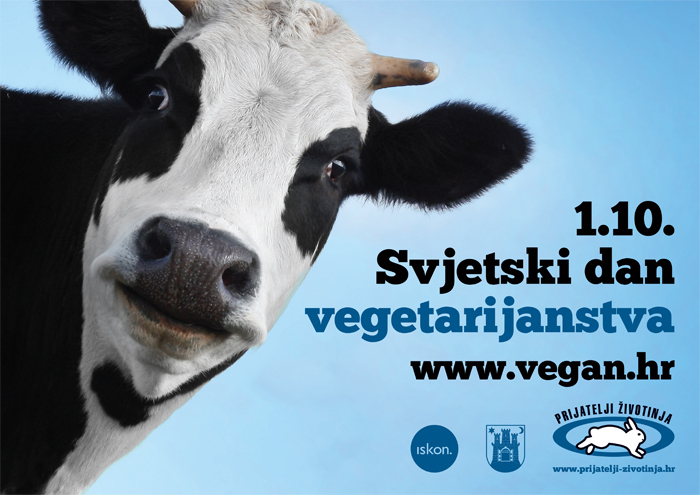 In order to encourage people to reflect on the ethical, ecological, health, and humane benefits of a vegetarian lifestyle, activists from Animal Friends will be distributing information and free printed and video materials on October 1, 2012 on Trg bana Jelacica in Zagreb. Visitors will also be offered recipes for tasty veggie dishes, and there will be a petition signing for introducing vegetarian meals in public institutions. 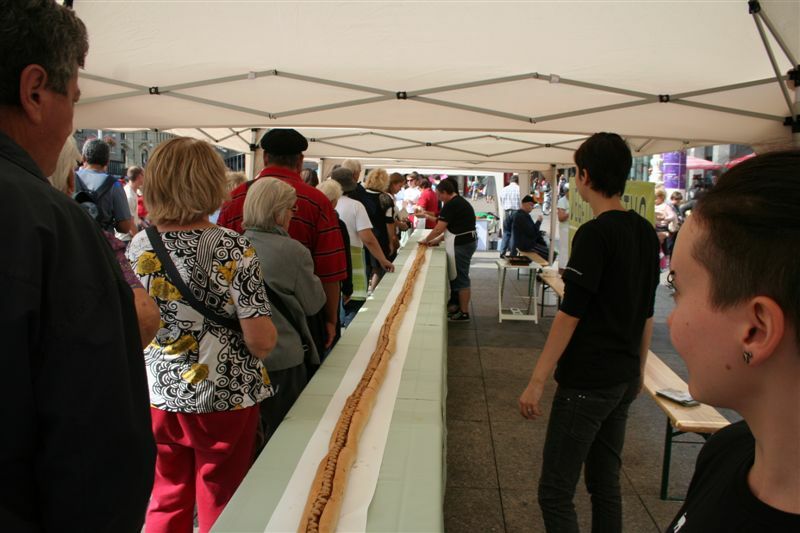 A special attraction at 12:00 p.m. will be the making of a ten meter-long veggie hot-dog, which visitors will be able to taste it. The visitor who guesses the exact length of the exhibited hot-dog will receive a special award. 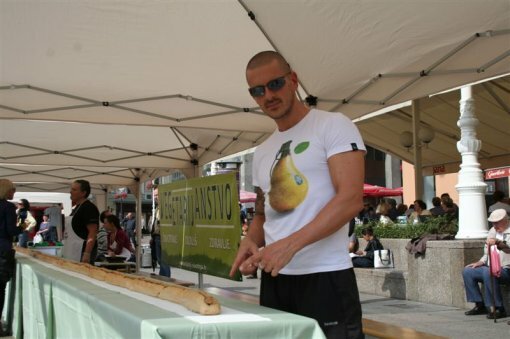 Tobey Maguire, Joaquin Phoenix, Leona Lewis, Alicia Silverstone, Venus Williams, Prince, Woody Harrelson, Jared Leto, Ellen DeGeneres, and Bryan Adams are only a few among today’s celebrities who have embraced a vegan lifestyle, which means that they consume only foods of plant-based origin. The vegetarian diet has a long history, dating back to ancient Greece. The first person in Europe who spoke about its benefits was the Greek philosopher Pythagoras in the 6th century B.C., who practiced and endorsed a cruelty-free lifestyle. The word "vegetarianism" comes from Lat. vegetus, which means "healthy, fresh, vigorous", or homo vegetus, which denotes a person who is physically and mentally healthy. Thus, the original meaning of the word indicates a balanced, philosophical way of life, rather than merely a style of diet consisting of fruit and vegetables. 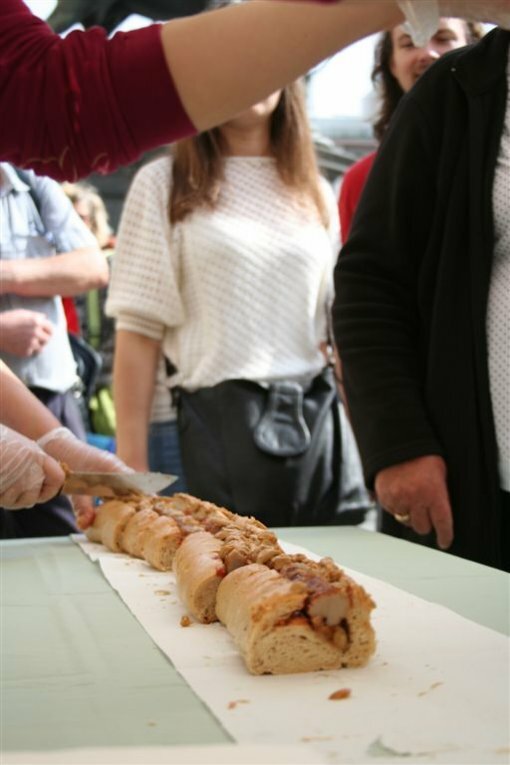 The first Vegetarian Society was founded in England in 1847. 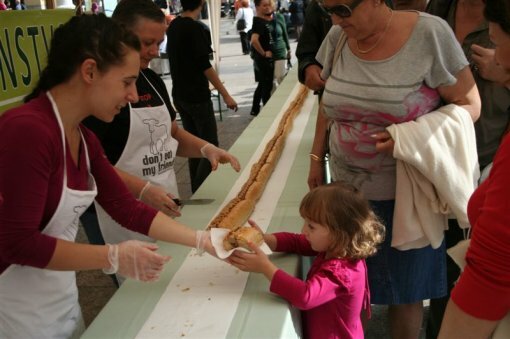 Vegetarians do not eat animals, i.e. meat or fish, and many also do not eat eggs. Like vegetarians, vegans embrace a meat-free lifestyle yet go one step further and do not consume any food of animal-based origin like milk and honey. In 2010, the European Parliament voted for an amendment that gave a legal definition and protection to the terms "vegetarian" and "vegan". This excluded from use terms such as semi-vegetarianism, which now serves to guarantee that the products which bear the label of "vegetarian" cannot contain ingredients that originate from the body of an animal (including fish), while those labeled as "vegan" cannot include any ingredients of animal origin. This year, October 1 offers everyone a good opportunity to celebrate World Vegetarian Day by switching to a vegetarian lifestyle. Or, one may choose to start out slow and begin eating only plant-based foods one day a week on Mondays. For vegetarians, it is an opportunity to take a further step for their health, animal welfare, and the environment, and to become vegans. 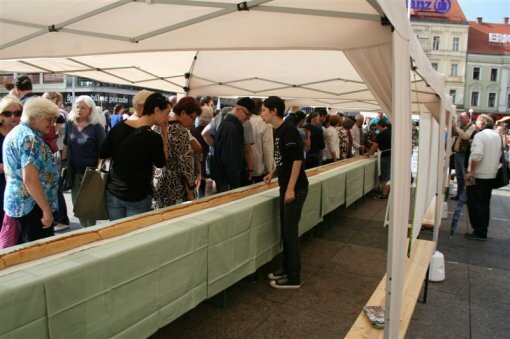 The great popularity of vegetarianism is firmly supported by scientific results, which confirm that vegetarians, and especially vegans, are on the average healthier and stronger, and that they live longer. Today, when more than 60 billion animals are killed every year for human consumption, and the ecological consequences of farming threaten the world with a disaster, it is certainly necessary that we should all think about the suffering of these sentient beings and start creating a better world for all animal species, including humans.